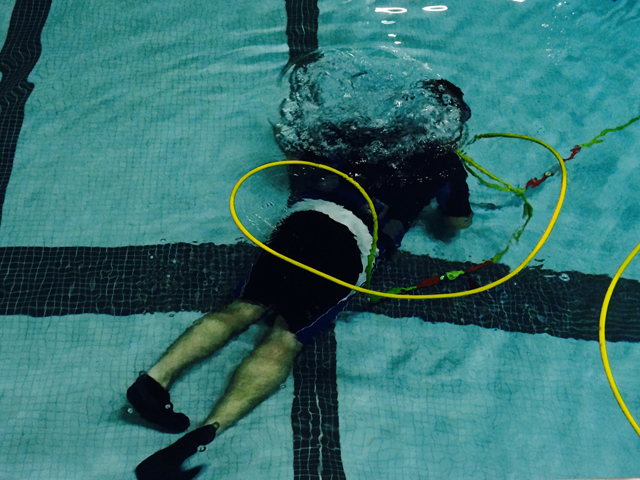 In December, a diver helped to find the leaks in the pool. While the record-setting winter storms became the dominant focus for the schools and the community at large, the work on the swimming pool has continued. The bonding of the pool equipment has been completed. This work was not part of the original plan to address needed repairs. The bonding issues were traced back to the pool’s original construction and were discovered when saw-cuts were made in the deck to install the new starting blocks. The town’s electrical inspector mandated an independent inspection prior to any sign-off of the bonding issues by the town’s office of the building inspector. This was completed by CEG Field Services, Inc of Hopedale, MA. The work has been approved by the electrical inspector. We are now in the process of filling in the tracks where the saw cuts were made to install the grounding wires, and replacing the tile over these cuts. This photo shows how the tile was cut to accommodate the wiring for the new bonding. Additional pressure testing was performed on the plumbing, and no issues were found. 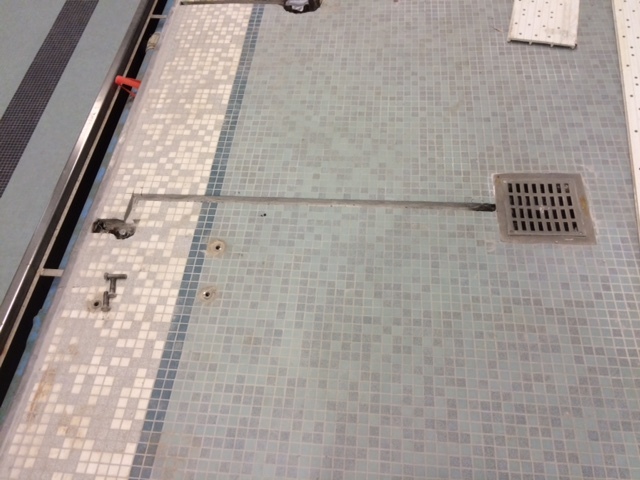 The focus is on the two original drain boxes at the deep end of the pool. The engineers are working on a PVC membrane liner for the old boxes and a compression fitting to ensure a tight connection. Once this is completed, the additional leaks identified by the diver using a dye test will be repaired by Thompson’s Waterproofing. There is a sequence to the work that needs to be followed. The town building inspector will need to inspect all work prior to approving the refill of the pool. Once the inspector signs-off the pool can be refilled and balancing of the pool water will take place. During the down time, the natatorium has received a very thorough cleaning, and the walls have been painted white to brighten this very appealing space. The air quality and acoustical improvements from the new HVAC system are most notable to those who have used the pool in prior years. The staff would like to have a reopening event for our swim and dive team members, who responded to the pool issues with very mature patience and understanding. The 1300 students in the high school and STEM Academy eagerly await their opportunity to use the pool for physical education classes. The aquatics director has been training our physical education teachers so they will be properly certified for our swimming program, and she has been creating the curriculum for the program. Our robotics club is also looking forward to using the pool in conjunction with activities and competitions planned by our STEM Advisory group, and with support from our new partnership with the Marine Institute for innovation, Research and Sustainability. Here is a video created by Gil Newton and Eben Franks describing the opportunities for creating Underwater Robotics . Our pupil services department has been working with our aquatics director to plan activities for our special needs students. The school budget funds the staffing and operation of the pool for our PreK-12 program. The district supports community use of the pool during designated times, but the funding source for community recreation is not within the purview of the School Committee.